Malta’s English Language Teaching (ELT) sector has recorded a healthy increase in student numbers and student weeks for 2014. A new study commissioned by FELTOM (Federation of English Language Teaching Organisations Malta), 2014 FELTOM ELT industry survey report by Deloitte, shows that the number of foreign students studying English in Malta grew by 2,558 over 2013. This represents a 3.4% increase in student arrivals year-over-year, from 74,992 students in 2013 to 77,550 in 2014. The FELTOM report indicates a healthy sector that is contributing substantially to Malta’s tourism economy, and it makes a case for government and other stakeholders to support the sector more comprehensively for still greater benefits. In 2013, Malta’s ELT sector had experienced a decline of 8.4% in student numbers (year-over-year) so the 2014 increase of 3.4% is welcome news. However, the 77,550 students who studied in Malta’s ELT schools in 2014 is still down from the peak of 81,911 students in 2012. Even amid the 2013 decline, however, data from Malta’s National Statistics Office (NSO) showed that student weeks were on the rise. The latest FELTOM report indicates that this trend continued into 2014, with a 1.8% increase in the average length of stay for foreign students in Malta and a 5% increase in student weeks. 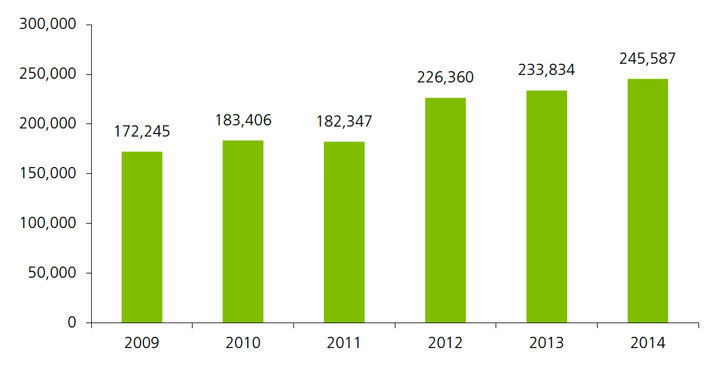 Official statistics show an increase from a total of 233,834 weeks booked in 2013 to 245,587 weeks in 2014. The market shifted slightly younger this year as well. Students aged 17 and under made up 27% of total student weeks in 2014 (compared to 25% in 2013) and stayed on average for two weeks. In addition, their numbers rose: they composed 45% of student arrivals in 2014 compared to 40% in 2013. 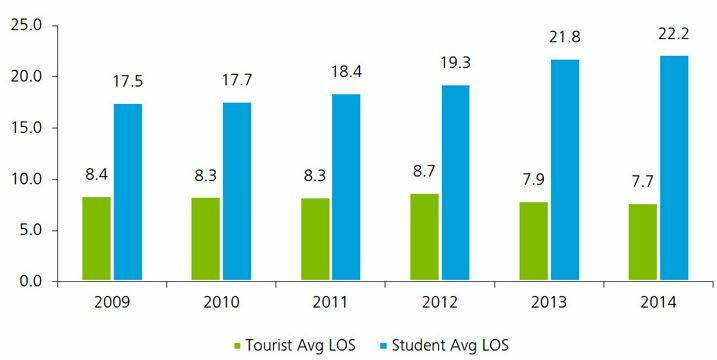 The ELT sector’s contribution to Malta’s overall tourism economy is significant: in 2014 ELT students accounted for 12.7% of total tourist bed nights in Malta, peaking in February and March and also in the busy summer period. ELT students stay in Malta on average for 22.2 days, which the FELTOM report notes is “almost three times longer than the average tourist based on general tourism statistics.” In fact, the 2014 average stay represents a slight increase over the 2013 average and extends a longer-term trend of modest year-over-year growth in length of stay. While the news that students are staying for longer periods of time in Malta is positive, it is a trend that is often accompanied by discounted prices for longer bookings. This appears to be a contributing factor for another finding in the 2014 report: total revenue per student week decreased by 0.6% among the 20 FELTOM member schools. FELTOM comments that the decrease might be linked to the increasing number of Italian students as well as given the price sensitivity of the Italian market. Italy remains the most important sending country for Malta, responsible for a 13% share of student weeks (up from 10% in 2013). Russia is next at 12% but its share fell from 15% in 2013 (representing a decrease of nearly 7,000 students year over year). A notable increase came from Libya, which composed a 10% share of overall student weeks in 2014, up from 7% in 2013. The report notes that the growth from Libya was cut short in the third quarter of 2014 as a result of the civil unrest that began in Libya at that time. Germany (9%) and France (7%) remained stable in 2014 in terms of student weeks booked. 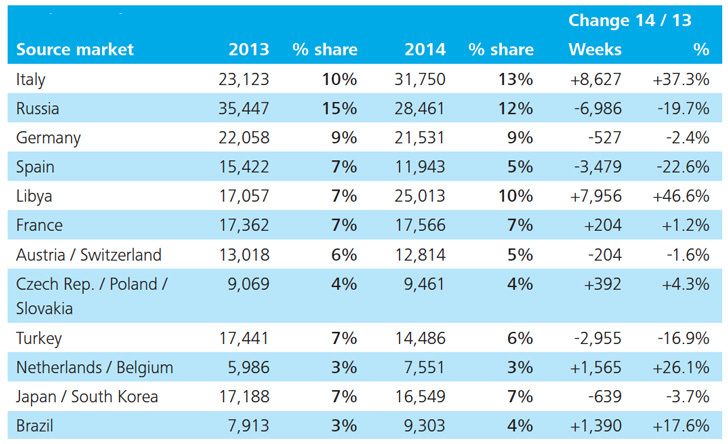 Spain slipped from a 7% share in 2013 to 5% in 2014, and Turkey and South Korea also registered declines. Meanwhile, there was growth from Japan, Brazil, and Colombia. These year-over-year shifts are summarised in the following table of leading source countries (by student weeks booked). “This support could come first and foremost in the form of commissioning this very much needed market competitiveness analysis from which even the tourist industry at large is bound to benefit. Another opportunity would be to foster a better and more effective collaboration between the ELT sector and university through pathway programmes that could attract students from large potential markets. Other forms of support would be better cooperation when it comes to visas by expediting applications for FELTOM members, and more advantageous routes and offers from our national airline, Air Malta. This entry was posted in Agents, Europe, Language Learning, Malta, Regions, Research and tagged student enrolment, Teaching English as a Foreign Language, language travel industry, youth travel, TEFL.